My Labor Day did not have an ideal start. I know that oversleeping on a three-day weekend emphasizes the point of the three-day weekend, but it came with a price: I was half an hour late to a fantasy football draft I had that morning. My goal of owning Michael Vick on at least one team this season – which would also be the team I’ve decided to care the least amount about – was dashed. I logged into my draft room, and found a fate worse than death: auto-draft had picked Tony Romo as my quarterback. As a Philadelphia Eagles fan, owning Romo (and also Miles Austin as my WR1) is the fantasy equivalent of extreme hari-kari (I’ve hated the Dallas Cowboys since childhood). As a fantasy football owner, not the worst thing in the world considering Romo’s 313 passing yard average and 2 touchdowns per game in 2010, prior to breaking his clavicle. In fact, Romo’s been regarded as a steal in most drafts, considering that that type of injury to a young quarterback raises a lot of eyebrows and in turn, a couple of drops to later rounds. I spent the rest of the morning moaning and groaning while packaging a trade offer to the league’s Vick owner: Romo and Santana Moss for The Redemption Kid. 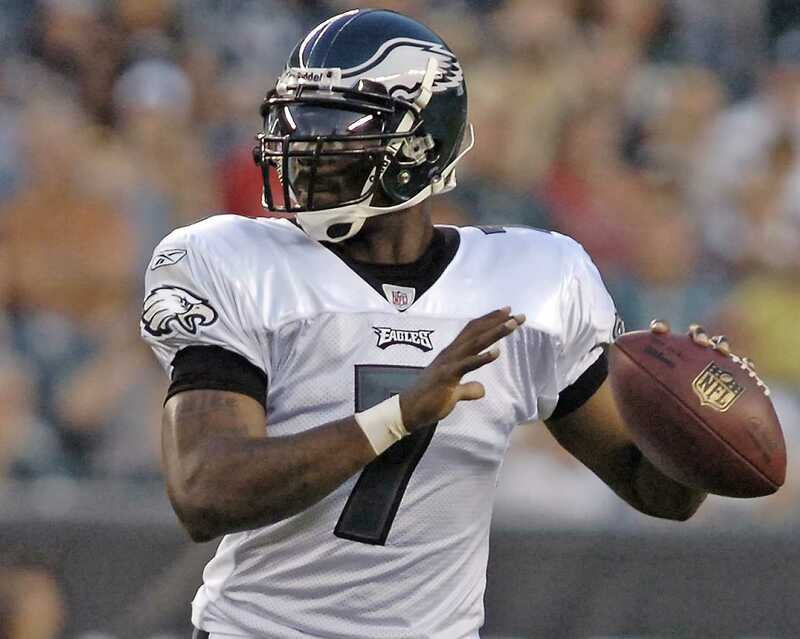 Sure, there’s tons of risk with owning Michael Vick this year (considering his inability to stay healthy for a full season), but there’s also tons of reward (considering his 8 year career total of 14,609 passing yards and 93 touchdowns, along with his 4,630 rushing yards and 32 rushing touchdowns). I don’t mind the gamble since I’ve also already drafted a higher priority, lower risk team. Frankly: I’ve wanted to own Vick since last year’s miracle season. I want to experience his unimaginable upside. I want to have a bigger reason to root for the Eagles. I want all the glory, despite the mindful guts. I want Vick, and I will stop at nothing until I have him. This, my friends, has been my life since I started playing fantasy sports in 2010. There’s not a lot to explain about fantasy that hasn’t already been said: fans like myself from the world over are addicted to it like a hot dog wrapped in bacon. We’ve reached a point in our society where we have fantasy golf and fantasy NASCAR. I repeat: fantasy golf. And fantasy NASCAR. I play in a 20-team baseball league with some friends of mine from my improv comedy days, and I commish a 10-team PPR (points per reception) football league with some crossovers from the baseball league. After an abysmal finish with baseball in 2010, I did endless amounts of research this preseason. My shrewdness has been rewarded with a playoff berth and a shot at our league title. In football, I’m planning to play in more than one league this year – each with a different scoring system – and to dominate. I’ve given up hours – HOURS – of my social life this year to be amazing at statistical guessing. That’s what fantasy is for the unconverted: looking at the streaks and slumps of your line-up and, based on an endless amount of stats, choosing which man (or woman) is going to be awesome at their job that night. Why be obsessed with something so meaningless? Especially when I try to make time in my schedule to lift weights and go running? Y’know – real sports. The short answer is: because it’s fun. The longer one is: because setting my mind to something, doing the research, and succeeding gives me an incredible feeling of accomplishment. At a point in my life when many things are up in the air, I feel like fantasy sports gives me an easy satisfaction. It makes me feel like something is paying off. Sad? Yes. Does knowing that deter me? No. If anything (just in case you though that last reveal wasn’t sad enough): winning at fantasy sports makes me feel like I can go out and do anything else I want. It just requires time to set a goal and do the work. From there, the only trick is to not mistake the finger for the moon, or don’t chase Vick when there’s also a blog post that I have to edit. Because if there’s one thing that fantasy and reality both share, it’s the ability to hate yourself when you wait too long to grab what you want.